Description: A free customizable performance appraisal spider chart template is provided to download and print. It can be applied to find out the most qualified employee. From the clear display of data, employees' deficiencies can also be found out instantly. 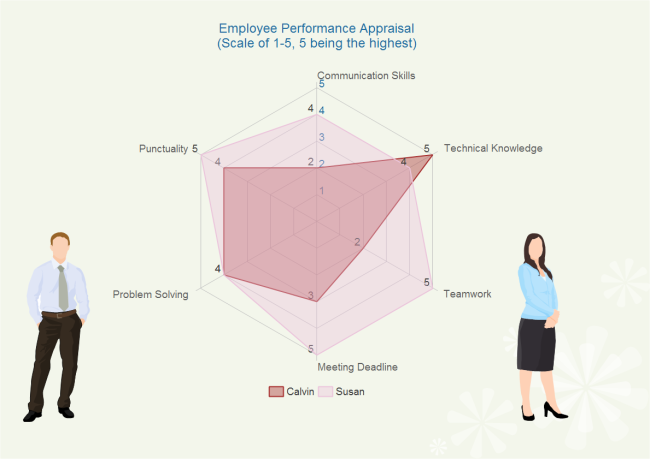 This performance appraisal spider example is created by Edraw Max, which is available in different formats. A great platform for sharing bar chart, pie chart, line chart, area chart, column chart, spider chart, and gauges chart. All shared chart templates are in vector format, available to edit and customize. Explore whatever fits you best and save for your own use.